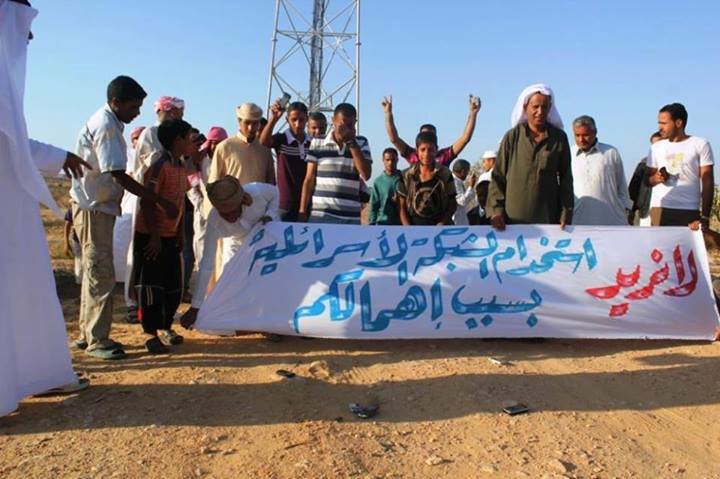 When activists in Egypt organized  protests against mobile and internet shutdowns in the Northern Sinai region back in 2014, in the “Sinai out of Coverage” campaign, they probably did not expect that it would still be relevant today. But just a few months ago, as the Egyptian army launched another military operation in Egypt's Northern Sinai region, the government once again ordered  a region-wide shutdown of internet and telecommunications services. Like so many times over the past five years, the shutdown left residents disconnected from the other parts of Egypt, and the world, and unable to communicate or call for help. And the issue is global. In India, the Software Freedom Law Center (SFLC) documented  70 incidents of regional internet shutdowns in 2017, compared to 31 shutdowns in 2016 and just 14 shutdowns in 2015. So far this year, there have been 40 shutdowns in the country. In Cameroon, for more than a year, internet in the country's Northwest and Southwest Anglophone regions has either been completely cut off  or slowed down to a point of uselessness. In Sri Lanka, authorities completely shut down  the internet in the district of Kandy in March 2018, in response to acts of sectarian violence. The government blamed social media for spreading hate speech and calls to violence. New research from Ranking Digital Rights , a nonprofit research initiative that evaluates internet and telecommunications companies’ practices affecting user rights to freedom of expression and privacy, shows that the world's largest telecommunication companies disclose little to no information  about their processes for responding to government requests to restrict access to networks or to certain services and platforms. 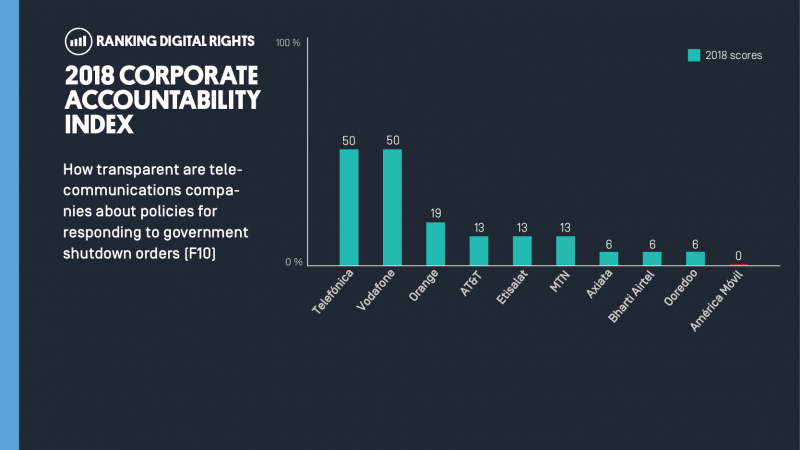 The 2018 Index ranks  10 telecommunications companies and 12 internet companies on a set of 35 human rights indicators designed to measure if and how well companies disclose policies affecting users’ freedom of expression and privacy. The Index evaluates policies of the parent company, operating company and those of selected services, depending on company structure. Read about the RDR methodology , research and scoring  criteria. In a number of countries in the Middle East and North Africa region (MENA), both government and “non-state actors” have ordered internet shutdowns or network disruptions, according to Asser Khattab who covers network shutdowns in the region for Social Media Exchange  (SMEX), a Beirut-based media development and digital rights organisation. The African Freedom of Expression Exchange (AFEX), a network of freedom of expression advocacy groups in Africa, characterized shutdowns  as becoming “rampant” in multiple African countries. Shutdowns most often occur in times when public safety or stability are under threat, such as armed conflicts, security operations, protests and political crises. But in these times where safety is of the utmost concern, network shutdowns hinder users’ access to information and communication services at a time when they are most in need. In India, where freedom of expression is in decline , network shutdowns are “yet another blunt instrument” to restrict this fundamental right, Mishi Choudhary, legal director at the SFLC told Global Voices. For instance, as part of the government’s crackdown against independence protests in Kashmir, Indian authorities repeatedly resorted to banning social media platforms  and disrupting access  to mobile internet networks and the internet, thus limiting residents’ capabilities to communicate, organize and express themselves. In areas of conflict, shutdowns can put people’s lives at risk. In Sub-Saharan Africa, Internet Without Borders (ISF), a nonprofit organization that works to promote digital rights in Africa, documented the many ways that an internet shutdown can get in the way of peoples’ work and vital day-to-day needs. Small businesses, tech startups, banking and money transfer operations, health professionals who use social media apps to communicate with patients in remote areas, journalists who depend on communication networks to cover and send stories, and even job-seekers are just some of those most affected. How should telecommunications companies handle government shutdown requests? Although companies may have little choice but to follow official orders, they could endeavor to give the public more detailed information when shutdowns occur. Who ordered the shutdown and for what purpose? Where is it taking place? How long is it expected to last? publish data about the number of shutdown requests they receive. Only two companies, Vodafone  and Telefonica , scored 50% on this indicator. All eight remaining companies, including French multinational group Orange , South-Africa based MTN  group and AT&T  scored below 20%. Vodafone was the only company to clearly disclose its process for responding to these types of government demands and to clearly commit to push back against demands when possible. Telefonica was the only company that disclosed the number of shutdown requests it received. RDR’s 2018 Index includes Indian telecommunications services provider Bharti Airtel  which revealed  almost nothing about the circumstances under which it complies with government shutdown requests, scoring only 6% on the indicator that assesses network shutdown policies as the graph above shows. Bharti Airtel’s poor performance is on par with those of the Malaysian telecommunications group Axiata  and the Qatar-based Ooredoo . The second MENA region company evaluated by the Index, the UAE-based Etisalat, also performed poorly scoring 13% on the same indicator. Operators in the MENA region “usually do not like to talk about it and feel uncomfortable to answer any questions after stating that this was ordered by the government,” Khattab told Global Voices. “Sources in Egypt’s North Sinai Governorate said that they are never notified about the shutdowns which could last around 10-12 hours, which adds up to their concern about the nearby military operations,” he added. Telecommunications companies are facing increasing burdens in this area, from all sides. Companies that push back on shutdown orders can risk losing their licenses or having their employees sentenced to jail. In Egypt, the parliament recently approved  a provision in a controversial cybercrime bill that will fine ISPs and jail their employees for up to one year if they refuse to comply with content censorship orders. Nevertheless, operating in a repressive regulatory environment should not prevent telecommunications companies from at least communicating to the public how they respond to shutdown requests, notifying users when shutdowns are about to happen, and naming the authorities that ordered the shutdown when they are not legally prevented from doing so. Publishing such information can help users and digital rights groups prepare to fight shutdowns when they are about to happen, hold to account those responsible, and raise awareness about their negative impacts.